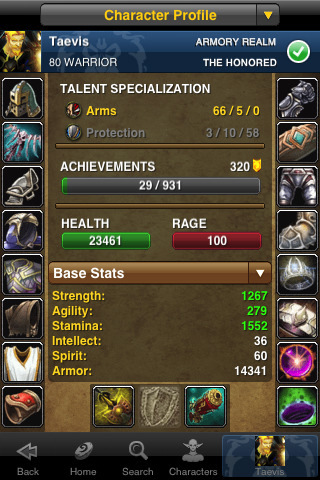 ‘World of Warcraft Mobile Armory’ – Show Off Your Purples, On the Go! Sure, you might still have your full tier 1 set in your bank from Molten Core, and you may be lucky enough to wield [Val’anyr, Hammer of Ancient Kings] but in leaving the comfort of your basement, all of your phat loot and sick achievements are left behind. Or rather, they were left behind, before Blizzard released the World of Warcraft Mobile Armory [App Store] for the iPhone. That’s right citizens of the Horde and defenders of the Alliance, Blizzard’s recently released app allows you to keep track of all your World of Warcraft characters, along with their stats, equipment, achievements and more. You can access your guild’s stats and calendar, as well as other informational and planning tools. 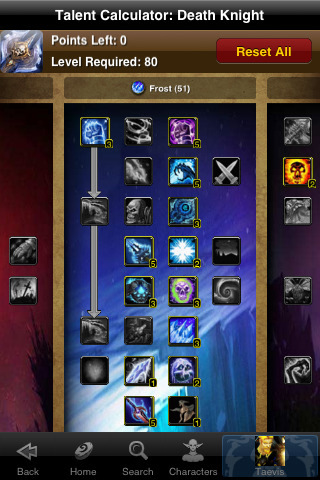 Experiment with talent trees or search for items, the World of Warcraft Mobile Armory can do it all. The World of Warcraft Mobile Armory is available as a free download, but requires a World of Warcraft or Battle.net account to use.